The hanamachi was the oldest of all the flower towns and our okiya was the largest. We had five geisha and many apprentices. The teahouse was open each day and we performed many geisha shows each month. Men came into our floating world to be entertained, but my life revolved around the world of sisters. I felt close to my sisters and our fates seemed intertwined. In time I came to realize that my new onesan was a troubled and deceitful woman. And one day I learned that she was the very woman who had driven my first onesan away. Inside the Yoshiwara geisha house, our okiya. 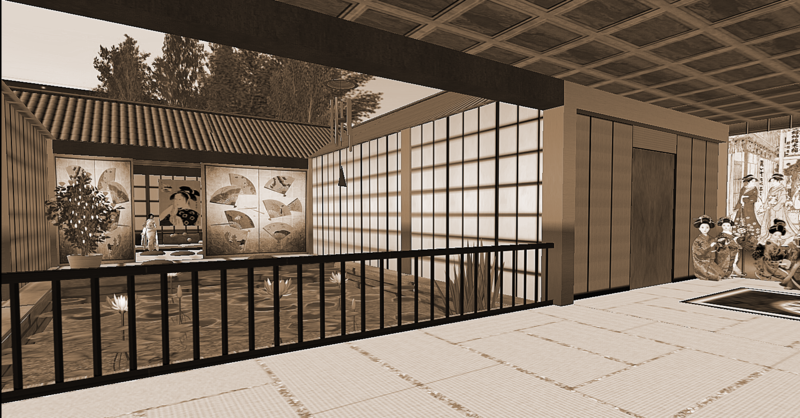 This entry was posted in Writing and tagged Geisha & Samurai, Photography, Preludes, Role Play, Second Life, Stories, Virtual Fantasy Life, Writing. Bookmark the permalink.